Mr. Longe is a banker who started his career in 1969 at First Bank Plc., where he rose to the position of Managing Director/CEO in July 2000. 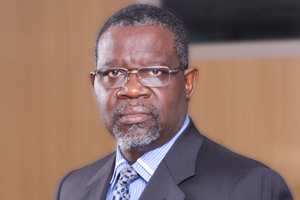 His achievements at First Bank included masterminding the introduction and implementation of the first International Money Transfer System in Nigeria, and overseeing the crafting and implementation of the Enterprise Transformation Project, “Century II”, before optimizing and consolidating the gains of that initiative by stewarding the “Century II The New Frontier” project. He is also a former Chief Operating Officer of Dangote Group of Companies and a former Group Managing Director & Chief Executive Officer of Transnational Corporation of Nigeria Plc. Mr. Longe is also a Fellow of the Chartered Institute of Bankers, Nigeria and has attended various technical, management courses and seminars including courses at Harvard Business School, IMD Lausanne and the Singapore Institute of Management. In recognition of his achievements, he was conferred with the award of Officer of the Order of the Niger, OON, in 2001 by the Federal Government of Nigeria.